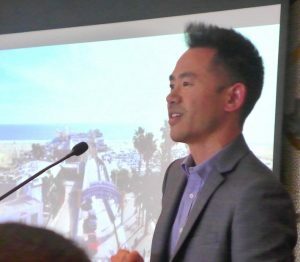 Australia is the number-one overseas tourist source for Santa Monica, LA’s beachside city situated between the Pacific Ocean and Los Angeles – and Santa Monica puts plenty of energy into promoting in Australia. 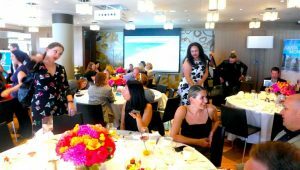 Travel agents and media attended a Santa Monica lunch at Sydney’s Park Hyatt yesterday, gaining insights into the latest developments and answering a quiz. Carol Kirchner of Infinity Holidays took the grand prize: return flights for two on United Airlines to Los Angeles and four nights accommodation. Today will see a Santa Monica media cruise on Sydney Harbour. This year, the Santa Monica team has visited Melbourne and Sydney, with Auckland to come. It visits Melbourne and Sydney each year, with the third city alternating annually between Brisbane and Auckland. You don’t need a car! It’s hard to believe in the USA, but true. The Metro Expo Line, extensive bike paths and the Santa Monica Free Ride shuttle make the going easy for the carless. A walkable 21.5 square kilometres. A 5.6-kilometre- stretch of coastline to explore. The weather is likely to be good. Over 300 sunny days each year. It’s just 13 kilometres north of Los Angeles International Airport (LAX). International leader at the forefront of health and wellness. Eight neighbourhoods offering a diverse mix of shopping, dining, recreation and entertainment. Santa Monica also offers 40 hotels, most right on the beach or within walking distance of the sand. Santa Monica hotels span everything from budget to boutique and a central location in greater Los Angeles places visitors near LAX, Venice Beach, Beverly Hills and Hollywood. With over 400 restaurants, Santa Monica caters for every taste. Visitors (and locals) come to Santa Monica to eat because of the variety of fresh, innovative cuisine – often locally sourced from Santa Monica’s own farmers’ markets – the relaxed, beachside atmosphere and some of the best undiscovered restaurants and nightlife spots in Greater Los Angeles. Santa Monica shopping includes downtown’s Third Street Promenade and Santa Monica Place – home to stores such as Nordstrom, Bloomingdale’s, Louis Vuitton, Tiffany & Co. and more – to upscale boutiques along Montana Avenue and the eclectic retail mix on Main Street. Each of the city’s eight neighbourhoods has a distinct character. Visitors wanting to stay fit and see the sights can try the beaches, surfing, paddle boarding, running trails, Muscle Beach and Santa Monica’s wonderful 35-kilometre bicycle path.